Modern amenities for the shower such as rain heads, body jets, steam showers and hand wands allow you to easily wash away the stress of the day. Take a look at these incredible spaces — from a stained-glass surround, to a soothing and meditative shower, to a Roman bathhouse-inspired space — to see how designers are taking advantage of today's materials and accessories. Middle ground. Divide your master vanity right down the middle with a stunning shower, like this glass enclosure made of two floor-to-ceiling panels and a door at the end. The textural shower wall creates an instant focal point, too. All around. Have your shower give your tub a hug. This shower enclosure encapsulates a full array of body jets and shower heads, while the round tub sits snugly in the middle of the design. I love how the unique shower shape has doors on both sides! Behind closed doors. 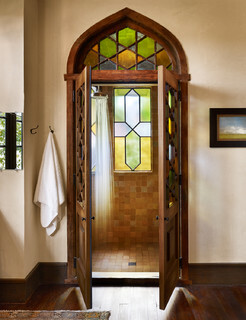 These stained-glass doors open into a heavenly shower experience enhanced by an oversized rain head. The light spilling through the colored glass could even become a form of chromotherapy, where colored light restores balance and energy. All in one. Save time and space by positioning your bathtub inside your shower. 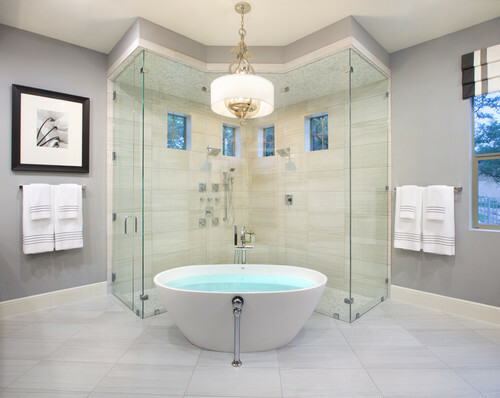 The frameless enclosure holds both the shower and the freestanding bathtub in one stunning area. Ancient history. 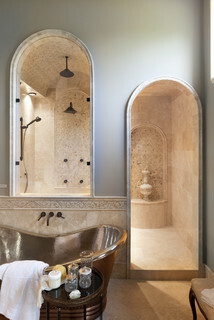 Repeat history and re-create a Roman bathhouse feeling with arched doorways and marble tile. A stainless-steel tub and a luxurious shower with multiple shower heads and body jets can soothe you just as much as an ancient spa, but with all the modern amenities. Sleek and modern. This super-modern shower steps away from everything traditional. The vanity's glass backsplash defines the entire space, separating the vanity area from the adjacent shower. 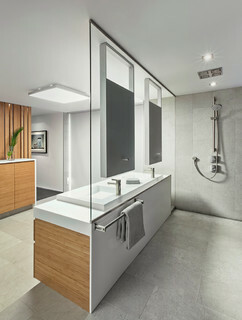 With mirrors on one side and towel hooks on the other, the single piece of glass manages to serve both spaces effortlessly. Soothing and meditative. 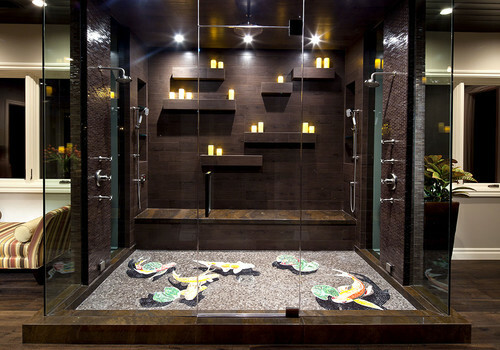 The dark and cool color palette in this shower creates a serene feeling, reflected by the colorful koi mosaic floor. I love how the wall-to-wall bench allows you to soak in the jets, rain heads and steam in utter relaxation. Center stage. This bold shower immediately calls out as the room's main attraction. Two vertical towers that hide the plumbing appear as columns to the eye. 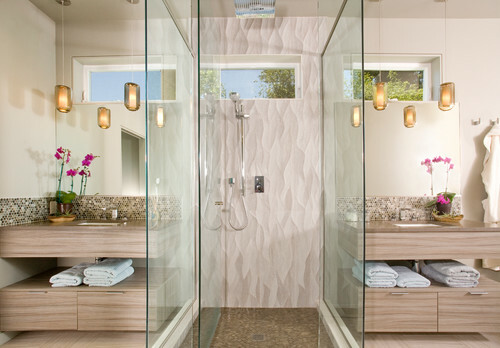 The seamless transition from the shower floor to the floor beyond is stunning — although it's certainly not for the shy.